How is Joe Bast Like Joe Camel? 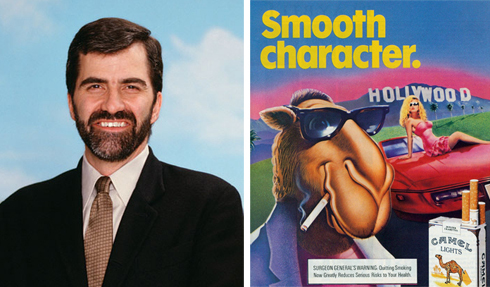 Looks Like We’re Going to Find Out…..
How is Joe Bast like Joe Camel? Well, let’s see – they both promote the sale of addictive poisons to children, they both are funded by the tobacco industry, and they both are leading proponents of the anti-science movement that threatens to cripple our education system and our economy. Joe Bast is the President and CEO of the Heartland Institute, a right wing “think” tank in Chicago that has been the prime mover behind major disinformation initiatives on both global climate and tobacco dangers. Not surprisingly, the Heartland has been the recipient of major funding from both tobacco and fossil fuel interests over the years. We’re going to be finding out a lot more about the Heartland Institute and their operations in coming weeks and months, thanks to an anonymous whistleblower who, on Valentine’s Day, opened a gmail account, sent a bundle of damning internal documents to key climate bloggers and researchers around the country, then closed the account and disappeared. Now, in a statement, Heartland is admitting that the budget and donor documents are genuine, but claiming that an alleged “Policy” paper is a forgery. Heartland’s policy positions, strategies and budget distinguish it clear as a lobby firm that is misrepresenting itself as a “think tank” – it budgets $4.1 million of its $6.4 million in projected expenditures for Editorial, Government Relations, Communications, Fundraising, and Publications, and the only activity it plans that could vaguely be considered policy development is the writing of a curriculum package for use in confusing high schoolers about climate change. Among the documents were tantalizing clues as to where major funding for the climate denial movement is coming from, and who it’s going to. The information is flying faster than any one person can keep up. As stated above, Heartland has now released a statement claiming that one of the alleged internal documents is a fake. It’s worth noting that several credible sources have pronounced the material genuine. I will keep updating the situation as best I can. Personally, I was skeptical of these docs, at least until I read the 2012 Fundraising Plan, which attacks the temperature station data of the “the National Aeronautics and Atmospheric Administration (NOAA).” That kind of error is classic Heartland. Those Heartland folks are such satirists. Philanthropy “etymologically means the love of humanity,” whereas funding climate denial and inaction, as the Kochs do, is perhaps the cruelest thing you could possibly do to humanity. My colleague Brad Johnson has just blogged on Heartland’s “Secret, Corporate-Funded Plan To Teach Children That Climate Change Is A Hoax,” which I’ll excerpt at the end. It’s funny in the way that The Shining was funny. These documents just make no sense, kind of like climate science denial itself. Perhaps this is a spoof put out by The Onion. An alleged document that is being examined, and which Heartland now states is a fake – describes a plan to pay a consultant 100,000 dollars to prepare a program designed for “dissuading teachers from teaching science”. We are concerned that schools are teaching climate change issues in a manner that is not consistent with sound science and that is designed to lead students to the erroneous belief that humans are causing a global warming crisis. We hope that our efforts will restore sound science to climate change education and discourage the political propaganda that too often passes as “education”. In Heartland’s statement, it is acknowledged that that budget and donor information are genuine, and apologizes for the security breach. Ironically, Heartland’s position seems to be that stealing electronic documents from right wing think tanks are viewed as a serious crime, while stealing emails from climate scientists and University labs are considered behavior to be lauded and encouraged.